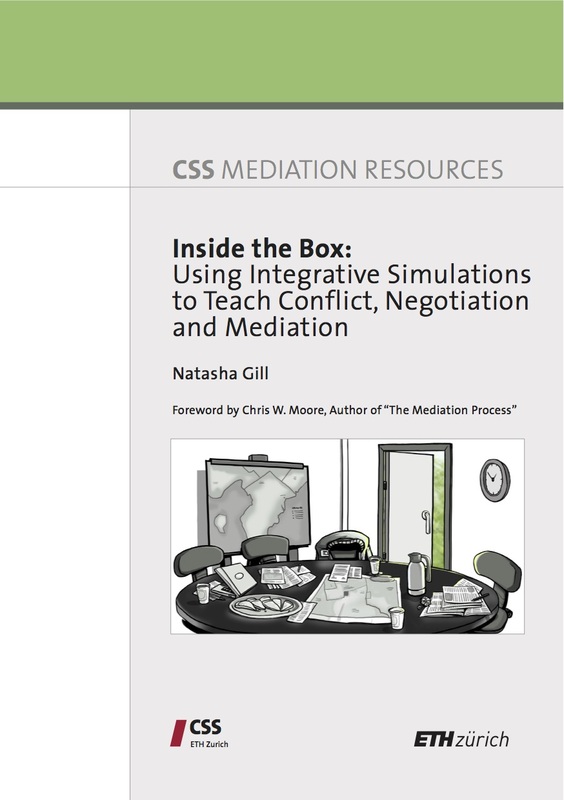 Natasha Gill, Inside the Box: Using Integrative Simulations to Teach Conflict, Negotiation and Mediation. Zurich: Center for Security Studies, Swiss Federal Institute of Technology (ETH Zurich), 2015. Free to download. Natasha Gill (Track4) has written an outstanding guide on how to use role-play negotiation simulations to explore issues of conflict and conflict resolution. What’s more, it’s free! Gill’s “integrative simulations ” or “IN-simulations” ideally involve around 12-15 participants engaged role-playing negotiations of a real-life conflict over a period ranging from two days to several months. Participants are provided with substantial background material, and coaches with topic knowledge and negotiation experience help advise participants throughout the process. Her book provides an overview of organizing an IN-simulation, from preparation to implementation and aftermath; discusses what participants learn, and how and why they learn it; addresses some of the potential problems and criticisms of simulations as pedagogical tools; discusses how to handle potential problems that may arise; and offers a clear how-to manual and sample role packet/background material. Modules that run on auto-pilot, with little feedback or monitoring from instructors. Varieties of the above modules that include intensive input from instructors, but where supervision tends to focus on ensuring the game remains on track and participants are following the general rules, rather than on offering personal feedback to individual participants relating to their skills development, or their strengths/weaknesses in various areas. While these and other types of simulations can be exciting for participants and offer a variety of insights and learning experiences, they often miss out on some of the most crucial learning experiences that emerge from being immersed in a structured, intimate and realistic negotiation. She is critical of “war games” and crisis simulations (pp. 145-146) for generating an intense and chaotic decision-making environment in which players are unable to appropriately contemplate their positions. Fictional conflicts, Gill argues, cannot generate the appropriate degree of emotional commitment to roles. She very much favours teaching participants as the game unfolds. Her emphasis is generally on learning rather than policy analysis, and think-tank games come under particular criticism (pp. 51-21, 132). Her commitment here to a single model provides the book with admirable coherence and clarity of focus. On the other hand, some may may feel that she pays inadequate attention to other ways of doing things. 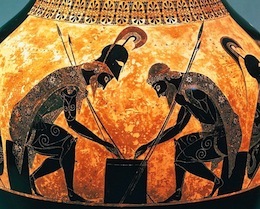 In my own work I am more inclined to take a “toolkit” rather than “model” approach, one that emphasizes that different simulation and gaming tools may work better in different contexts or to explore different aspects of conflict. If you want to encourage deep reflective thinking and interchange, then integrative simulations clearly have a great deal to commend them. However, they tend to also work best with small groups who can invest substantial time in the process. Many role-play negotiations do not accurately model the disorganization, time pressures, and chaos of many real-life talks. The 2000 US-Israeli-Palestinian talks at Camp David are a case in point: despite their calm, bucolic setting, they were, in the words of one Israeli participant, “the worst organized negotiations I had attended in my professional life.” There was little pre-negotiation, technically knowledgable advisors kept at arms length, poor negotiation records were kept, and the parties were surprisingly ill-prepared. In some cases, key parties never meet face-to-face, or stakeholders never get a seat at the table but rather make their views felt in other sorts of ways. In such cases other game mechanisms can be used to model this. In the Syrian refugee simulations I’ve conducted, for example, the refugees are engaged in a quite different (but interlinked) “survival” simulation while the higher-level refugee policy negotiations are underway. If you can find the human resources to provide coaches, and you’re running very small simulations in which the facilitator can give everyone face-to-face time, that’s great—but it isn’t always possible. Moreover, in some cases there is value in letting participants make mistakes and learn from their consequences, rather than coaching too much. Simulations may have wholly legitimate analytical purposes too, not just experiential ones. On the issue of think-tank games, a previous PAxsims exchange between Gill and Devin Ellis (here and here) explores this issue in further detail. In fairness to Gill, however, she is clear that the purpose of her book is not to survey the broad range of simulation approaches, but rather to discuss how her IN-simulation approach works. By all appearances it works very well when applied in the way she suggests to certain types of negotiation, mediation, and conflict resolution issues. Moreover, in the course of discussing the approach she has much to offer more broadly on learning, integration onto curriculum, assigning players, dealing with difficulties, and a range of issues beside. The insights that she offers are substantial, and this book should be required reading for anyone working in this field or who wishes to use such techniques for conflict resolution training or in an academic classroom.